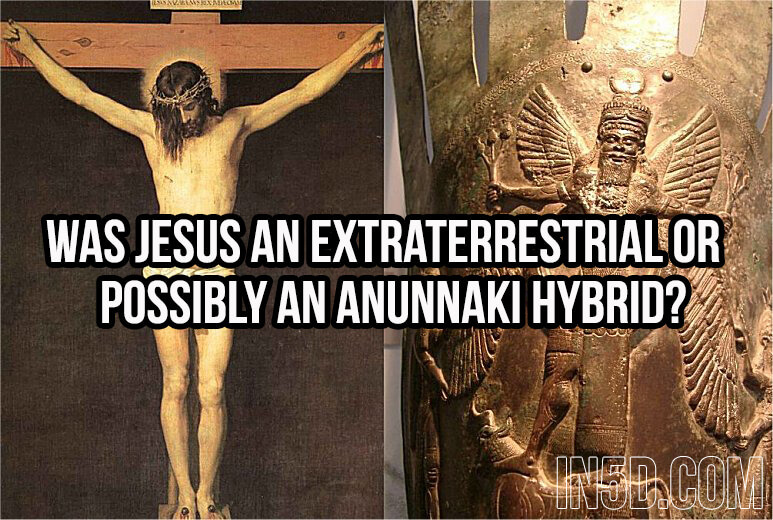 Home » Was Jesus An Extraterrestrial Or Possibly An Anunnaki Hybrid? From my studies of theology, I have learned that the figure known as Jesus was created by the Council of Nicea in the year 325 AD as a way to bring together all of the Yeshua ben Yosef cults via Emperor Constantine. The council added the supernatural abilities of Mithra, Horus, and Osiris to the Jesus entity they created and from that point forward, Christianity was created. The bible has missing chapters such as the Book of Enoch, The Book of Jubilees, the Book of Numbers and the Book of The Wars of Jehovah, so one must question why any books would be eliminated and why. What we know through these missing books is that Jehovah (El Shaddai and eventually called, YHWH) was known as “Lord” and was a god of vengeance and wrath. Is it possible that when Jesus replaced Jehovah that people are unknowingly worshiping the same god of vengeance and wrath? What is known about the bible is how it was written in perfect, reverse astrotheological order as we move through the precession of the equinoxes, which explains the reverse order of the astrological signs. For example, when the Israelites idolized the Golden Calf when Moses went to the mountains, it symbolized the Age of Taurus. When Moses blew on the ram’s horn, it symbolized the Age of Aries. When Jesus fed the masses with two fish, it symbolized the Age of Pisces. When Jesus said to follow the man bearing the pitcher of water, it symbolized the Age of Aquarius. If nothing else, the bible teaches us about how astrotheology was used to control the masses because the bible’s timeline brings us to an artificial “end time” right now, which is why we’re seeing those in power trying to evoke the “Revelation” chapters when we could be living in a world of peace and harmony instead of chaos. What if the bible is an encrypted timetable for the return of our galactic family? Is it possible that the ruling elite know this and are trying to create the end times to prevent humanity from ascending in order to harvest our energy for their own, archontic reasons while keeping us living in fear as economic slaves to a broken system of fiat currency? Perhaps these times will bring us the return of the Anunnaki, the creator gods? It’s interesting that in Genesis 1:26 (Genesis = The Genes of Isis), it says, “Let US make man in OUR own image“. The “US” are the Elohim, who were the creator gods in the bible, but is it possible that they are the Anunnaki as well? What we do know is that name “Jesus” never existed at the time of his alleged birth because the letter “J” wasn’t invented until the 1500’s. This also means there was no official John, Job, Jacob, Jeremiah, Jude, Joseph, etc… The King James version of the bible wasn’t written until the year 1611 and was edited by Rosicrucian and Free Mason, Sir Francis Bacon. With ties to secret societies, is it possible that the truth was twisted and/or encrypted? What we do know is that there is a Christian bible on the main floor of any Freemason lodge, but when you get to the 33rd degree of freemasonry, the Luciferian Doctrine is followed by those who have been initiated into this level. Additionally, the 33rd degree mason motto is “Ordo ab chao” which means “Order out of chaos”. Is it possible that our DNA is about to fully activate after being genetically manipulated by the Anunnaki? Is this something we can do for ourselves? Is Jesus the same as the Maya’s Kulkulkan and the Aztec’s Quetzalcoatl? It seems many things that are in humanity’s best interests are suppressed. Look no further than Stanley Meyer’s invention of a water powered car that could go from coast to coast in the United States on 22 gallons of water. He was offered $1 billion by the automotive industry but turned it down because he wanted this invention to go out to the people. Shortly afterwards, he was poisoned to death. There was a blonde hair, blue eyed man by the name of Kulkulkan who visited the Maya and taught them about astronomy, agriculture, medicine, and mathematics. It is believed that he came from the Pleiades to help the Maya civilization and promised to return at some future date. The same entity is described as Quetzalcoatl by the Aztecs. Could this story be the same as the story of Jesus? Is it possible that Jesus was an extraterrestrial from a neighboring planet or star system? We know very little about Jesus from the time of his birth until his 30’s. If the star of Bethlehem was a UFO, then is it possible that Jesus went back to his mothership to prepare himself for the teachings he would give to the masses until the time of his alleged death? As Michael Tellinger points out, the most compelling argument against the mythological gods theory is that roughly 9,000 years BC prior to the appearance of Sumer, the Mayan civilization suddenly emerged and astoundingly showed the same predilections towards agriculture, planting, harvesting, social organization, trade and commerce as Sumeria, all attributable to the teachings of the gods. It is possible, even likely, that more than one ET group or groups have left their mark on earth. In this writer’s opinion, the story of Jesus was created by the church as a means of subservience, control, and conformity to religion and government. While it’s definitely possible that an entity with supernatural abilities existed, he was most likely an extraterrestrial or possibly an Anunnaki hybrid.